Seriously, ZOS. I'm BEGGING YOU..... make the lily pads with those ugly pink flowers on them movable!!! All over my Villa, ok fine...they are ALL OVER Arteum i get that. But Xanmeer? Really? Please stop throwing them around like a drunk person with confetti at a wedding reception. We begged on PTS for Summerset housing testing. We begged again in Murkmire housing testing. I'm revisiting that plea.... Enough already with them. Not everyone likes them. You could _at least_ have used different color ones in Murkmire. Purple, white, yellow, ANYTHING but that pink and it would've been enough of a change to argue that they are local flora. Heck, you could do a whole Swamp Plant Package and have had them in there in different colors and made a killing! Just, for the love of housing, stop sticking them on all our natural waters and let us move them PLEASE. the placements aren't even good. Master Furnisher, Master Alchemist, and Trueflame Discount and Specialty Pot & PoisonDealer. That's kind of like asking for a Rubble-B-Gone kit for all these expensive houses. Sounds like a fabulous idea, but I doubt they will pull any of the designers furiously placing lily pads all over Elsweyr as we speak to come back and make the current ones removable. True, but the rubble (collapsed Alinor pillars not withstanding) are full on design choices for the actual walls etc. the lily pads are already an independent item, all they have to do there is unlock them for us. *sigh* I really hate those damned things. At least they could have done white or purple in the Murkmire house. Not cloned the obnoxious pink Summerset ones. Bleh. I hope those designers furiously clicking away in Elswyr sprain their fingers for their trouble. Maybe it's just not the right house for you? Heck, you could do a whole Swamp Plant Package and have had them in there in different colors and made a killing! Swampy Plants pack - but I'd be down for a version 2. I invented Healing in ESO - want proof? I love them, but I don't love that they aren't movable and I think it was a cheap shot for them to install them in houses and make them static. I reeeeeeally want to take all mine and put them in my Dawnlight Palace pools, dangit. I agree 100%, I would love to see all of the plants of Murkmire, including those lovely lantern light flowers that dangle from the Hist trees. The pink flowers do not fit the theme after they have been used so often already, as the OP points out. I would be happy if they made them movable. Although, they could just make them purchasable separately and I wonder why they haven't already? My only hesitation with moving them is, if they make everything totally customisable, does that mean houses/areas begin to lose their character? Does that mean most people then make all their houses, or the areas surrounding them, look more-or-less the same, every time? Is it more interesting if you are forced to work with what you have, to an extent, like a real gardener, or interior designer, would be? However, it might make you think outside the box a bit more, if you are presented with something to work with (even if it's something you wouldn't, necessarily, have chosen yourself), rather than a totally clean slate, every time. For example, have you thought of juxtaposing dark with light, OP? Just because you have pretty flowers there, it doesn't mean you have to make everything pretty, around them, if you don't want to. thats just it though, spamming them all over two zones no where near each other and have no zone relation is just lazy on ZOS's part. A real Gardener would get rid of them if they didn't like them. a real interior designer covers them or knocks down the offending structure. ZOS doesn't give us these kinds of options. We pretty much NEVER get clean slate housing to work with when yards and water are involved. Which is something we've been asking for and they have only sorta compromised there. As for the folks saying "maybe just not the house for you, really? Because they refuse to let us move their precious ugly pink flowers i should not get the house with many features i DO like? no. it means i have a legit complaint with zos. there are TONS of actual murkmire flora that could have been chosen from. instead they spam something from Summerset/Arteum all over it. I'm not saying DON'T have them at all.... I get some folks like them, im saying let us MOVE them. this was a main complaint during testing of the Villa too, all those lovely pools and you're stuck with more pink on pink lighting in a pink sky.... come on. I don't think it's too much to ask after a zone and a half packed full of them for ZOS to back off a bit on the pink lily pad shaker. I'm not saying DON'T have them at all.... I get some folks like them, im saying let us MOVE them. Agreed. I think they are beautiful, but they would be much more welcome as a movable furnishing. [A real Gardener would get rid of them if they didn't like them. a real interior designer covers them or knocks down the offending structure. I know it's your house, not a client's, so I agree you should be able to do what you want with them. However, from an artistic point of view, dealing with things you wouldn't normally choose to place there, yourself, might make you produce something interesting that you wouldn't otherwise have reason to produce. But, yeah, they should let you move them, if you really can't stand them/work with them. It's your house, after all. So.... I haven't done much with housing yet. 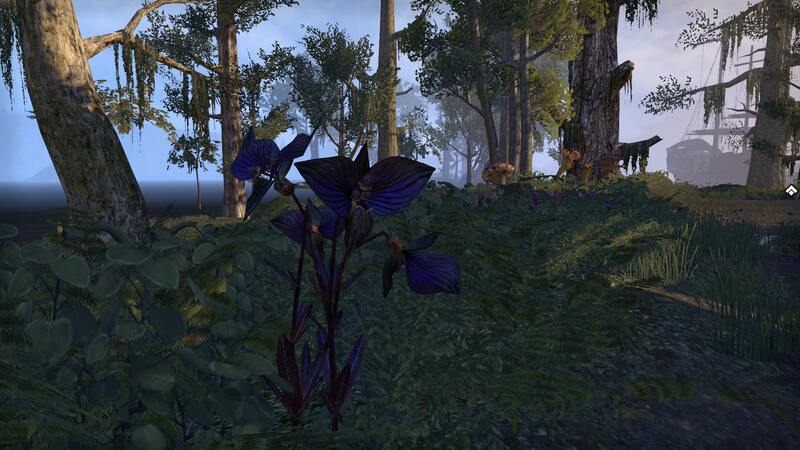 Those lovely Vvardenfell "Black Bat Lilies" according to a friend who bought some IRL for her mother - are those available somewhere? Bat Blooms were on the luxury furnisher, should be available once a year or so for gold. I do believe they can be bought for crowns in the housing editor store as well. the lily pads are already an independent item, all they have to do there is unlock them for us. I think you are making an assumption on how Zos build these homes. Yes, they could "free" the lily pads but it may not be as simple as "unlocking" them. Only the furnishings are truly independent. Oh, and Zos has stated about other art work that once it goes live they will not change it. This is essentially art work and really no different than the rubble in some homes as the first reply pointed out. True.... but they had said that about some of the newer giant mosses at first and they wound up unlocking those as well as compromising with us with the broken Alinor columns we can move in the colossal grotto. I’ve also been comparing the in-game homegoods vendor small lily pads and those are patterned suspiciously close in design. The ones stuck all over the houses just got blown up bigger and flowers added is all. I have also used the kind of software they build these games with, it is absolutely actual “items” they are creating and placing. You can even get off map and see the building blocks of new zones if you know how and see it. The ability to add them to the loot tables, and make them movable is there. The Artistic Choice they are refferring to in the other housing debate you mention. The rubble and ruins. That isn’t a locking or unlocking of an item as much as it is ZOS choosing to make all the walls and pillars and doorways etc in the building materials and big beautiful psijiic buildings look like they are crumbling. Some of those tumbled columns locked in the villa are identical to toppled columns you can move in the grotto. Some are the same but bigger too. I think letting ZOS skate with something that LOOKS MOVABLE under the guise of Artistic License is just encouraging them to put less thought and consideration into the design rather than more. They claim to listen to our feed back- if we want them to keep listening we have to keep poking them and calling them out on poor “Artistic Choices”. Otherwise they assume we like their choice and they keep doing it. And for the record.... xanmeer didn’t “go live” yet technically therefore arguing the lily pads is totally reasonable for about 15 more hours lol.